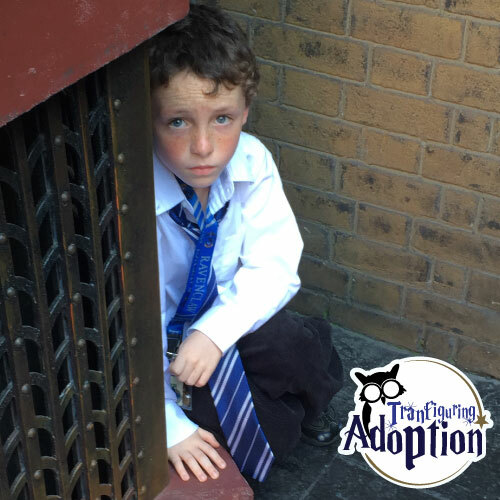 Your foster – adoptive family have been looking forward to going to Universal Studios Orlando for weeks – maybe even months. You have gotten each other excited about the rides and things you want to see in the park. You’re especially stoked to experience the Wizarding World of Harry Potter. What happens when you finally get to Universal? All of these points will make any person fatigued. It only affects a child from a traumatic past all the more. I remember quite a few trips where I, Darren, just BARELY kept my cool because I was tired, thirsty, and hungry – my blood sugars were too low. This all affects any “normal” functioning person and can take you to the breaking point. The issue worsens with our children because their brain chemistry looks different. Trauma has literally rewired things in their mind. Thus, when they suffer from the points from above, they’re fighting to stay under control even MORE SO than a person without a traumatic past. Without an intervention a MELTDOWN is imminent. In an online article, “Caught Between the Amygdala and a Hard Place,” by Karyn Purvis, PhD & David Cross, PhD, it is suggested that a parent can help their foster adoptive kiddos succeed with good behavior by providing proper nourishment every two hours. Dr. Purvis and Dr. Cross suggest in the article that foods that are low in sugar content be given and give the examples of turkey, rich grains, whole grains, and lentils. Personally, our family has witnessed several situations where melt downs were in the beginning stages in the park. When my wife and I notice this occurrence, we stop everything to take inventory of when the last drink/food break happened during the day. Usually, we have gone more than two hours without hydrating with water or getting some substantial food. Taking fifteen to thirty minutes to meet these needs have helped our family to stomp out many started meltdowns and enjoy Universal Orlando longer into the day. 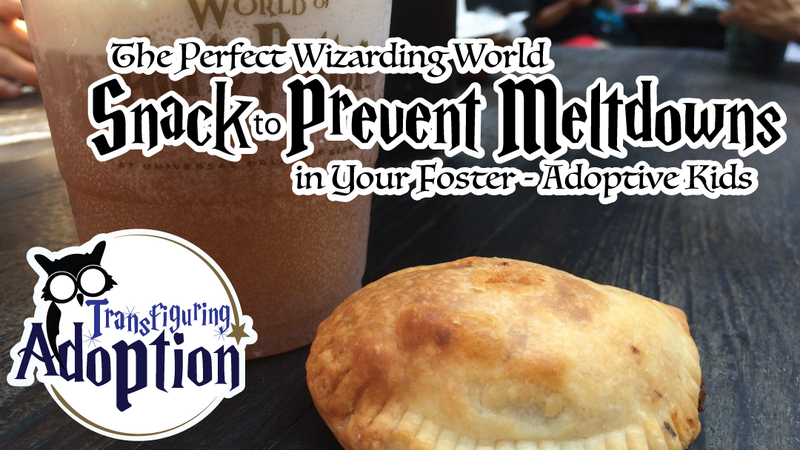 Cornish Pasties are a snack that are sold in the Diagon Alley area of the Wizarding World of Harry Potter. They can be purchased at The Hopping Pot in Carkitt Market of Diagon Alley. What is a Cornish Pastie? 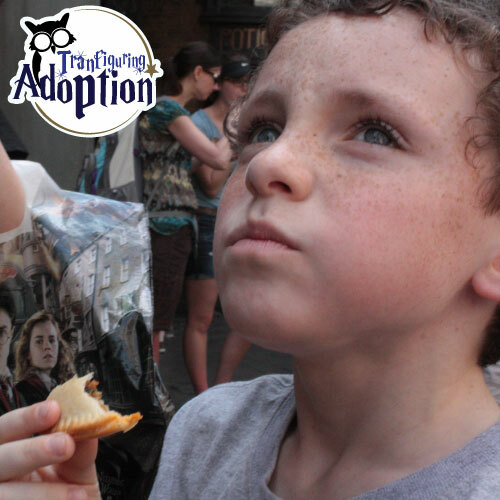 Many people want to grab the Butterbeers and chocolate frogs for a snack. However, those sugary treats are not going to stabilize blood sugars. Actually, on their own they’re going to spike sugars (helping for a bit) and then quickly crash. WARNING. Meltdown city! 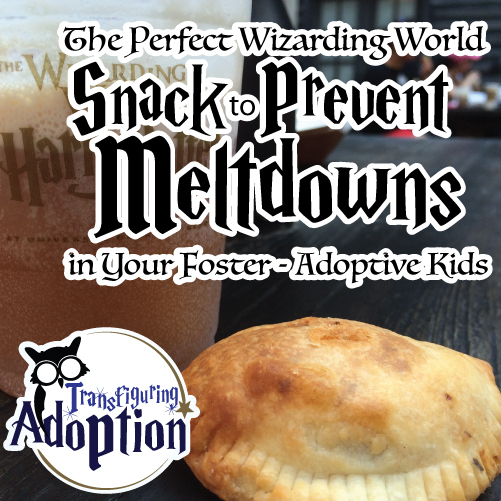 The Hopping Pot’s Cornish Pastie treats have more solid nutrition that is going to stabilize sugars without the crash. This means you’re giving your kiddo’s brain fuel so they can keep it together while dealing with the sensory bombardment they are getting all day long. Note: We are NOT advising families to stay away from the sweets. Just make sure you’re getting some substantial nourishment every couple of hours and stay hydrated. 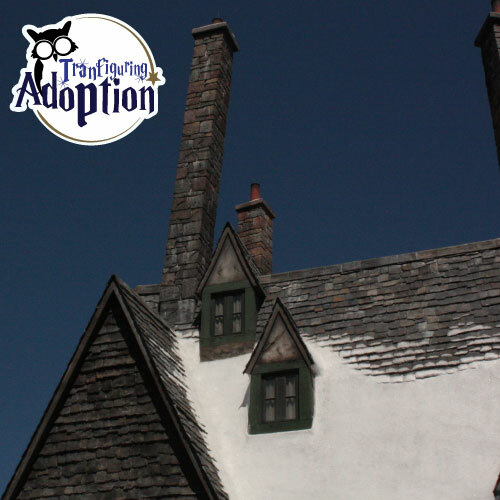 We have other tips and advice for visiting Universal Studios Orlando with foster – adoptive kids. Email us with any other questions. 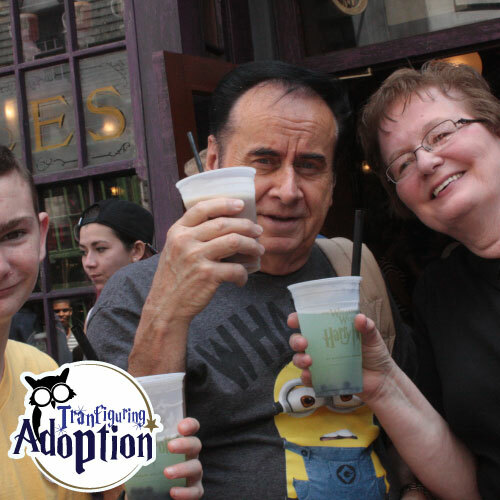 Also, let us know other advice that you have for families visiting the Wizarding World of Harry Potter. 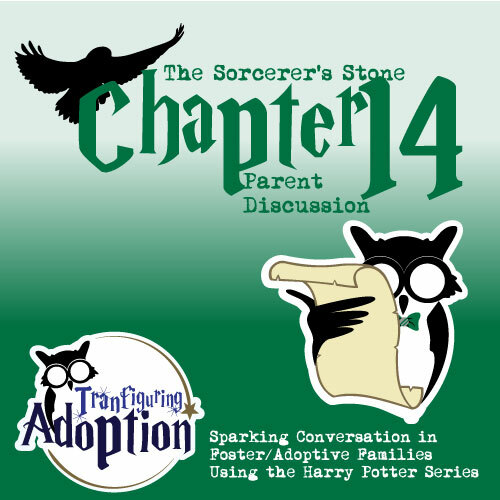 Many foster and adoptive parents have to cope with sensory issues with their children. What is the deal with sensory issues? Essentially children living life with sensory issues are having to cope with their brain processing the world around it differently than the average person. A foster child may process sound more sensitively than the general public. Consequently, noises that are at a comfortable volume for others may sound like loud booming sounds. A sound that is really loud may be simply deafening and deathly scary. I’ve had someone try to equate living with sensory issues like going through life constantly like you’re walking through a carnival midway while someone is scraping their nails on a chalkboard AND trying to deal with life. Imagine trying to take a test at school when the fluorescent lights are overpowering your eyes. Try to listen to a math lesson when the tag in your shirt is literally driving you crazy. 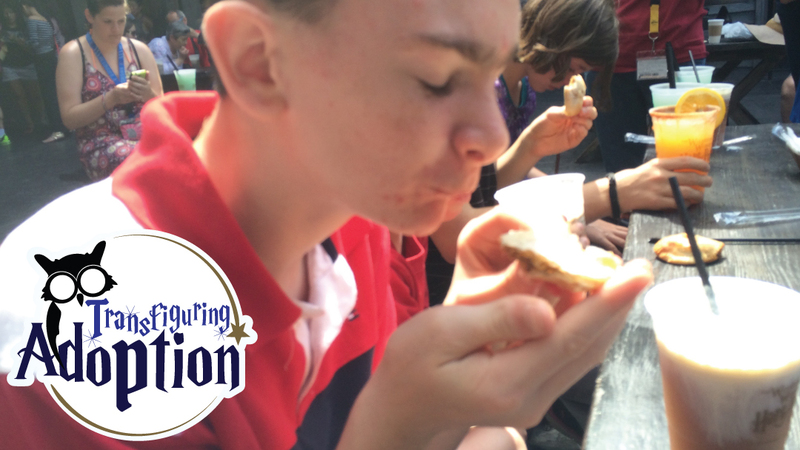 None of our children have been formally diagnosed with sensory perception issues. What do you think though? One of our children had constantly wanted lotion all over his body before he put on clothes, PJ’s, robe… anything. We’re not talking about the suggested amount of lotion either. I’m talking about such a thick coating of lotion that it was seeping out in between the fibers of the cotton shirt this child was wearing. One child with a charismatic personality will become a wall flower if you place them in an event with lots of people, noise, and activities. This child has also been known to start covering their ears as though the suitably set volume of music were blaring loud. The Wizarding World of Harry Potter at Universal Orlando is a popular destination for vacationing families. Both the Hogsmeade and Diagon Alley areas are wonderfully immersive. The parks have been so well done that you will doubt whether the Harry Potter books are actually fiction. The harsh reality for a foster family is that everyone wants to witness this immersive park. This means that while you might be in a crowded environment in the rest of Universal, The Wizarding World is going to be absolutely jam packed. Tons of people means lots of noise, too much to look at, and unusual smells. 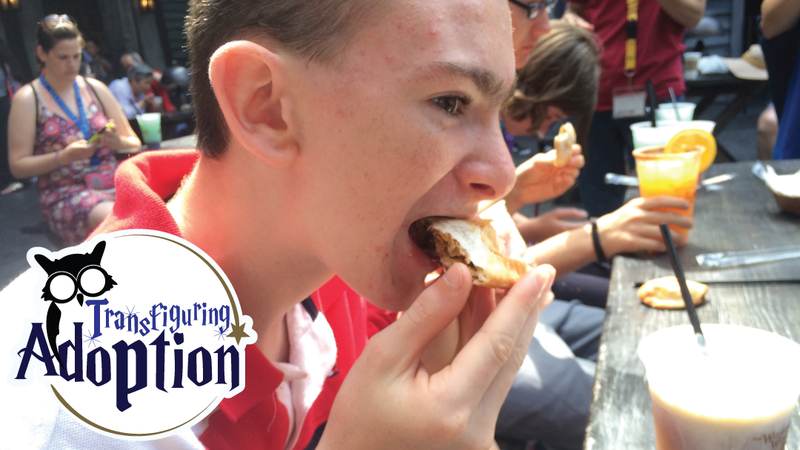 During one visit to the Diagon Alley area of The Wizarding World, my son’s senses had met their match. 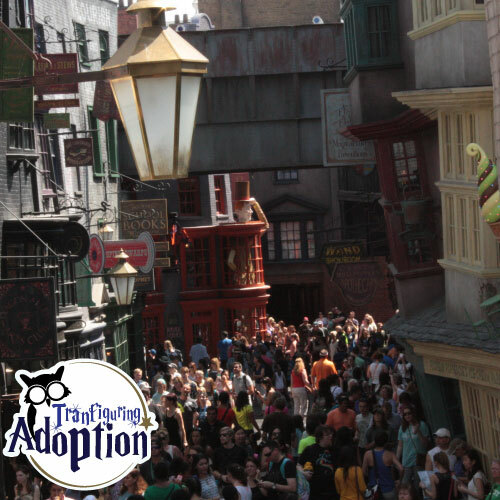 Our family entered Diagon Alley, which is an experience in itself. There were people everywhere. My youngest son wanted to enter into the Quidditch store immediately to the right of the entrance. Simply walking to the store a few feet away brought about so much bumping and jostling within the crowd. Once inside the small aisles and space of the Quidditch store, the bumping and density of the crowd increase. Plus, being in an enclosed area made the crowd noise heighten. Finally, let’s mention that my visual senses were bombarded. Not only were there people all around me to be aware about, but I was looking at scads of amazing merchandise and there was an animated Quidditch poster. After taking some exciting and fun time looking around at things in the store, I was feeling a bit overwhelmed and like I needed to get to more open spaces. Strolling out of the store I was able to feel the ease of being in a more open space. My wife got my attention and pointed over to a little corner nook by the shop. My youngest son had tucked himself out of site in the nook. He traded between covering his eyes and covering his ears. His face and eyes looked exhausted. His senses desperately wanted a vacation for a few minutes. If any family is going to make it through the day to witness as much fun as The Wizarding World has to offer, a family has to guard themselves against fatigue. This means mom and dad have to have enough energy as well as the kids. However, when kids start to melt down because they are too tired of dealing with their senses being bombarded, what are you going to do? 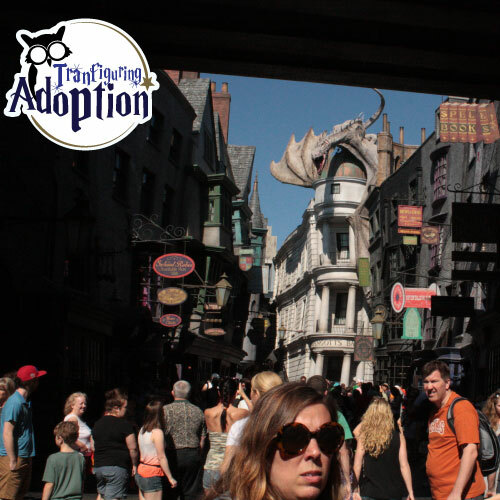 While we were exploring Diagon Alley, we discovered a gem that will help you on your trip with your foster and adoptive children. Madam Malkin’s Robes For All Occasions is a store that sells apparel in The Wizarding World. Once we entered the main entrance, I immediately noticed a doorway to the right. I continued to explore the clothing store but made a mental note to revisit this mysterious doorway – assuming that it simply went to the next adjacent store. After exhausting everything there was to see at Madam Malkin’s, I walked through the mystery door and saw… nothing. It was an empty room. Well, the main floor was empty but the area near the ceiling was littered with cages holding faux owls that were hooting. As our family stayed in the owl emporium area, I bet we witnessed about ten people enter and quickly exit the room within a time period of 15 minutes. Visual Rest – Eeylop’s Owl Emporium is an empty room. It’s not a complete bore because you can look at the owls and cages near the ceiling. Vacation from Touch – With minimal people entering this area, it will give you a break from the jostling crowd in the main areas of the park. Auditorial Spa – Compared to the main areas of the park, the noise level is minimal. Taste – Grab a snack and head to the owl emporium. Letting blood sugar levels get too low makes it difficult for anyone to cope with life. Getting a drink or snack will help level out those levels and give your mood a lift. Children from difficult circumstances have blood sugar levels that are harder to maintain. Experts recommend eating something every two hours for these kiddos. Protein is a great option as it provides more stability in sugar levels. 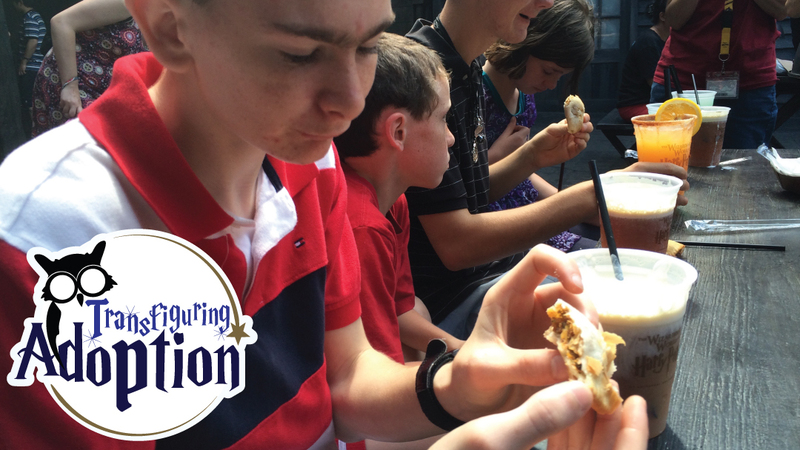 We recommend cornish pasties from The Hopping Pot for a good snack to split among the family. What other areas have you found in The Wizarding World that let your family find some much needed rest? Have you been to Eeylop’s Emporium? Did you find that it was a good place for your family to get some rest?